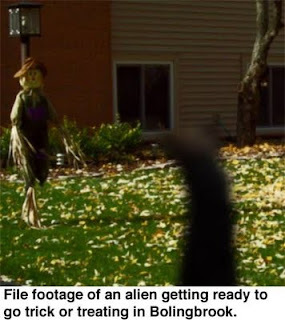 The Bolingbrook Babbler: Bolingbrook allows aliens to go trick or treating! Bolingbrook allows aliens to go trick or treating! Bolingbrook’s Department of Interstellar Affairs will ease their regulations on October 31 to allow more aliens to go out trick or treating. According to Henson, there are four appearance classifications for aliens. Normally, only Class A aliens can be seen in public with a proper disguise. For Halloween, Class A and Class B aliens will be allowed in public, provided that their public appearances must be Halloween related, and they cannot reveal their true origins to the general public. Joq Luq, a long time Clow UFO Base resident, says he enjoyed last year’s Halloween outing. Mayor Roger Claar feels it is important for the aliens to mingle with humans once a year. Kno Lockmo has a really scary costume in mind. All aliens must report back to Clow by 1 A.M. Any incidents between aliens and humans should be reported to the Department of Interstellar Affairs. Psychic: Jay Cutler will leave Bears and win the Super Bowl with the Lions. Skeptical singer Geroge Hrab invades Chicago on 11/19!